Central Chile, home to a majority of the population, includes the three largest metropolitan areas- Santiago, Valparaíso, and Concepción. It extends from about 32° south latitude to about 38° south latitude. The climate is of the temperate Mediterranean type, with the amount of rainfall increasing considerably and progressively from north to south. In the Santiago area, the average monthly temperatures are about 19.5° C in the summer months of January and February and 7.5° C in the winter months of June and July. The average monthly precipitation is no more than a trace in January and February and 69.7 millimeters in June and July. By contrast, in Concepción the average monthly temperatures are somewhat lower in the summer at 17.6° C but higher in the winter at 9.3° C, and the amount of rain is much greater. In the summer, Concepción receives an average of twenty millimeters of rain per month; in June and July, the city is pounded by an average of 253 millimeters per month. The numerous rivers greatly increase their flow as a result of the winter rains and the spring melting of the Andean snows, and they contract considerably in the summer. The combination of abundant snow in the Andes and relatively moderate winter temperatures creates excellent conditions for Alpine skiing. ChileQuest will design an itinerary according to your needs, in which you will be able to find all aspects that make this region one of the most attractive and interesting destination. 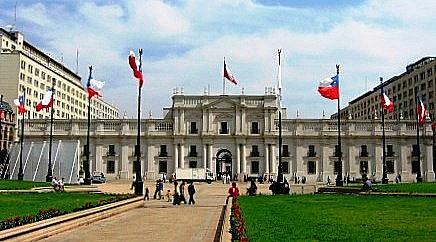 We invite you to discover Santiago & Central Chile. See our Programs and Activities.